This recipe: avocado and bacon. I think you could make anything from these ingredients and have it taste awesome. Grease 12 muffin pans with melted coconut oil. Finely dice onion and bacon. Brown in a fry pan. While that's cooking, mix the avocado flesh and eggs together thoroughly. (I use a fork). Add coconut flour, baking soda and salt and pepper and combine well. Make sure you break up any lumps. Fold through three quarters of the cooked bacon and onion mixture. Divide mixture between muffin pans. Top with reserved bacon and onion. Cool before removing from tins. These look yummy! Do you think they would freeze well? These seemed a bit 'mushy' to me, but perhaps that is just how they are? I did use almond flour instead of coconut flour, so it could have been that. Still very delicious, but were yours quite soft even when fully cooked? Hi Sara, sorry they turned out mushy for you. If you were going to use almond flour, you would need to adjust the recipe, adding a lot more than the 1/2 cup of coconut flour that I used. Coconut flour soaks up HEAPS of liquid, so you can't swap it 1 for 1 in a recipe with almond flour. Thanks, coconut flour is a bit tricky to get around here, I think ground chia would do the trick for soaking up the moisture. Also my avocadoes were enormous, which probably didn't help even though I only used two of them. I will fiddle with it once this batch is gone. The good news is that the PHOTOGRAPHS were awesome, so once I get the recipe tweaked, I'll blog it with a link to you. Hi Deb, did you use coconut milk from a can or from the carton in the dairy section? 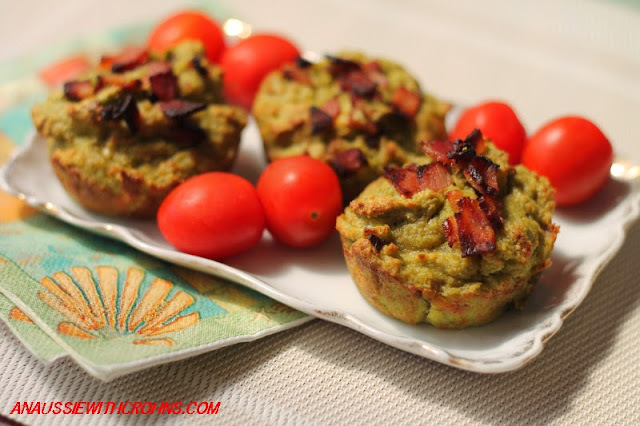 We bought an abundance of avocados and this recipe is going on my TO TRY RIGHT NOW list! lol Thanks! I made these today and they are good. Do you happen to know the calories for each muffin if evenly distributed in muffin tin? I haven't worked out the calories, but if you enter all in the ingredients into a site like My Fitness Pal, you'll be able to work it out. All I have to say is I'm going to eat all 12, and not sharing with a single one of my kids. Wow.